More and more members want to use their MGs rather than just attend static shows. However, modern driving conditions often make that difficult and frustrating. Imagine what it would be like to find a smooth piece of tarmac with no speed bumps, road junctions or oncoming traffic - somewhere with challenging twisty bits and the odd straight to put your foot down. Now imagine if the only people using this 'perfect road' were like-minded MG enthusiasts and that you had the whole day to share the tarmac with them, with strict rules to ensure safety. Unbelievably, such days exist. 'MGs on Track' (MGoT) does what it says on the tin! 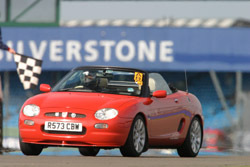 The organisation is run for MG enthusiasts, by MG enthusiasts - it's not a commercial organisation. 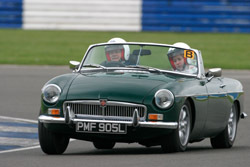 The philosophy is simple - to allow you to drive your MG around famous race circuits, like Silverstone and Brands Hatch, in safety and at the best possible price. MGoT days are intended for everyday cars and everyday owners - not specially prepared cars or experienced circuit drivers. They cater for all MGs from the occasional T type to the modern Z car with the majority being MGB/BGT/C derivatives and MGF/TFs. Take a look at the photo gallery on the MGoT website and you'll see the mix. The website also contains a discussion forum, frequently asked questions, and articles written by a people just like you about their track day experiences. What more encouragement could you need! You can register on the website for regular email updates about events as they are announced and booking is online.